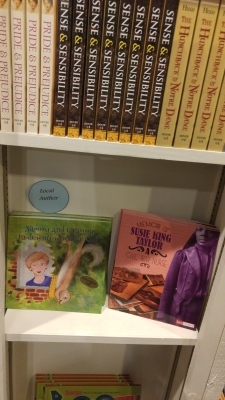 Book Signing & Coloring to follow! 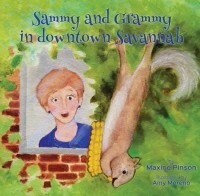 "Sammy and Grammy in Downtown Savannah"
​" The day to support your local museum stores!" at Hesse K-8 School. She was assisted by her husband, Bill, and grandson Ayele, who were in charge of displaying the original artwork created for the book. A Q&A session followed about "Life Lessons Learned" from the story. Each child received a "Sammy" coloring sheet and book mark to take home to remind them of the story. 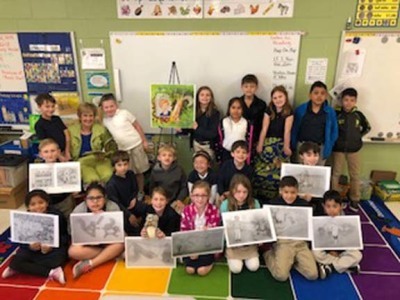 A Savannah author recently provided such a program to over 150 third grade students at Hesse when Maxine Pinson read her newest book, “Sammy and Grammy in Downtown Savannah,” the story of an ornery squirrel who takes up residence in a secret garden. But Pinson didn’t stop there. She asked the children what life lessons were learned by Sammy’s antics, then challenged them to explain their thoughts through a writing and art con- test. Awards were given for first, second and honorable mentions in each category, and every third grader went home on Valentine’s Day with a specially designed val- entine from Sammy himself, which contained the life lessons he had learned from his misadventures: KTCH, or be kind, be truthfu​l, be courteous, be happy. NOTE: This link can only be accessed from a computer. The "Dying Art" of Writing Thank-you Notes to Express Gratitude is NOT Dead Yet! sent her young friend Ellie, who lives in New York, a copy of Sammy and Grammy in Downtown Savannah for Christmas, she received this endearing note. THANK YOU, Ellie, from both of us! PHOTOS & VIDEOS of SAMMY, Jr.
Click photo above to see video of **Sammy, Jr.
eating his favorite food: avodado!